This is for the “Moms on the go” with babies who drink formula. I guess this bottle has been around for the last 10 years, but I just discovered it and am now on the hunt to find it! 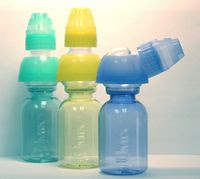 The travel bottle has a two-chamber design that stores the formula separate from the water. So when you are ready to feed your baby all you have to do is straighten the bottle and the formula mixes into the water. This is great–no more having to carry separate containers and formula spillage.